San Diego Union-Tribune Names Teradata a "2018 Top Workplace"
Teradata (NYSE: TDC), the industry’s only pervasive data intelligence company, today announced that it has been awarded a “2018 Top Workplaces” honor by the San Diego Union-Tribune. 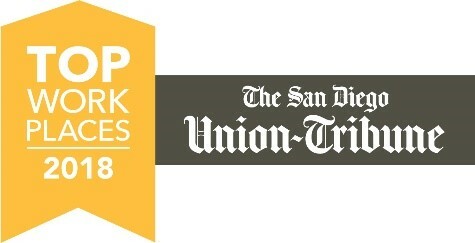 The Union-Tribune, San Diego’s largest media company, produces the annual list of the best places to work in the region based solely on employee feedback gathered through a third-party survey administered by research partner Energage. The anonymous survey measures several aspects of workplace culture, including alignment, execution and connection. In addition to being added to the list of San Diego’s top workplaces, Teradata was also honored with a “Spotlight Award for Professional Development,” which was based on positive employee feedback about providing the training they need to be successful in their jobs. Teradata was founded almost 40 years ago inside a Brentwood, Calif. garage in 1979. Today, it has grown to serve the largest and most visionary enterprises in the world. The company is made up of a community of more than 10,000 people worldwide who believe in the power of data to change the world and are ready to challenge the complexity and inadequacy of conventional approaches in pursuit of better answers. In early October, Teradata announced that it had completed the relocation of its global corporate headquarters from Ohio to San Diego, where it owns a four-building, 460,000-square-foot campus. Recently completed renovations to 65,000 square feet of office space within the Teradata campus added workstations and employee comforts. Teradata has hired more than 300 new employees in San Diego so far this year, with another 200 jobs expected to be filled by early 2019.